The hardest part of creating an export compliance program is knowing where to start. 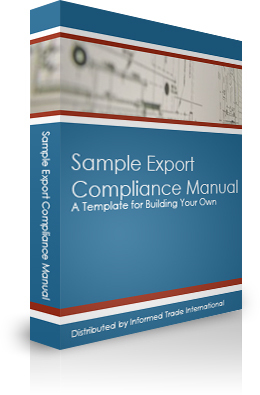 The Sample Export Compliance Manual published by ExportRules.com originally began as a consulting project for one of the largest defense contractors in the United States. After publication, we adapted many of the industry specific procedures to fit a more general company profile and serve as a template for the export community. Since that time, this manual has been used by hundreds of exporters, freight forwards, and compliance specialists including some of the most well-known names in the industry. We’ve done the research and left you with a fill in the blank starting point for your export program. This work represents weeks of intense writing, rewriting, and reviewing by licensed US Customs brokers and export professionals. It’s designed as a starting point for any business who’s exports are regulated by the Department of Commerce or the US State Department. When compared to the hourly rate of a dedicated compliance employee or export consultant, you can save hundreds or even thousands of dollars by building your program around a professionally written core set of procedures. This product is available for download only as a .pdf, .doc, or .txt file and requires a program that can read and access those file types. Thanks Keeton. We are very happy with the product- it is well done and will be a great addition to our existing policy literature. Probably saved us about 40 hours worth of research and writing. That’s about $4000, so definitely worth it for us. Our international exports are limited, but we know we had to have something in place for what we were doing. The manual gave us some good insight into what we needed to prepare for. I cannot thank you enough for making this Manual available. Our company is in the Armor business and in the process of getting registered with the US State Dept. I was the office administrator and must now step up to the plate to take care of the ITAR. I must say I am green when it comes to this. This manual has been a godsend to me. A wonderful education and a perfect way to get a professional start with export compliance policy. Last week I ordered the sample export compliance manual download. Being a newly appointed compliance officer for my company this manual has saved me countless hours of research. Very good product.